Get ready for a great day, armed with your Adventurers' Guide, explore and play in 100 acres of woods and parkland, discovering the amazing world of the dinosaurs. • Enjoy the Stone Age Road Race, Raptor Racers, Jurassic Putt, Lost World A-mazing Adventure, Assault-o-saurus and Arachnophobia before heading back home. 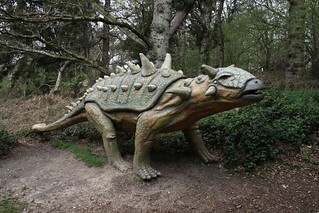 Come face to face with life size dinosaurs both great and small lurking in the woods on our Trail. Help our ranger discover how many T-Rex roam the woodland, using our radio, lookout towers and field stations to accomplish your mission. Make friends with the animals in our idyllic Victorian walled garden. Meet wallabies, sheep, pigs, donkeys and then head to the Fun Barn to cuddle a rabbit or guinea pig. Also check our creepy crawlies demonstrations board so you can handle them too. Have fun climbing, sliding, swinging and scrambling in our fantastic adventure play area set in parkland. Our 23 metre climb-a-saurus will provide much fun for children. There's plenty for all ages including our Tiny 'Terror'saurs for the under 5's.